For other uses, see Cyclotron (disambiguation). 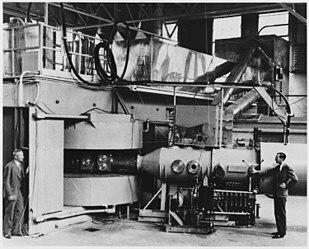 Lawrence's 60-inch cyclotron, with magnet poles 60 inches (5 feet, 1.5 meters) in diameter, at the University of California Lawrence Radiation Laboratory, Berkeley, in August, 1939, the most powerful accelerator in the world at the time. Glenn T. Seaborg and Edwin M. McMillan (right) used it to discover plutonium, neptunium, and many other transuranic elements and isotopes, for which they received the 1951 Nobel Prize in chemistry. The cyclotron's huge magnet is at left, with the flat accelerating chamber between its poles in the center. The beamline which analyzed the particles is at right. A modern cyclotron used for radiation therapy. The magnet is painted yellow. A cyclotron is a type of particle accelerator invented by Ernest O. Lawrence in 1929-1930 at the University of California, Berkeley, and patented in 1932. A cyclotron accelerates charged particles outwards from the center along a spiral path. The particles are held to a spiral trajectory by a static magnetic field and accelerated by a rapidly varying (radio frequency) electric field. Lawrence was awarded the 1939 Nobel prize in physics for this invention. Cyclotrons were the most powerful particle accelerator technology until the 1950s when they were superseded by the synchrotron, and are still used to produce particle beams in physics and nuclear medicine. The largest single-magnet cyclotron was the 4.67 m (184 in) synchrocyclotron built between 1940 and 1946 by Lawrence at the University of California at Berkeley, which could accelerate protons to 730 million electron volts (MeV). The largest cyclotron is the 17.1 m (56 ft) multimagnet TRIUMF accelerator at the University of British Columbia in Vancouver, British Columbia which can produce 500 MeV protons. Over 1200 cyclotrons are used in nuclear medicine worldwide for the production of radionuclides. The first cyclotron was developed and patented by Ernest Lawrence in 1932 at the University of California, Berkeley. He used large electromagnets recycled from obsolete Poulsen arc radio transmitters provided by the Federal Telegraph Company. A graduate student, M. Stanley Livingston, did much of the work of translating the idea into working hardware. Lawrence read an article about the concept of a drift tube linac by Rolf Widerøe, who had also been working along similar lines with the betatron concept. At the Radiation Laboratory of the University of California at Berkeley Lawrence constructed a series of cyclotrons which were the most powerful accelerators in the world at the time; a 69 cm (27 in) 4.8 MeV machine (1932), a 94 cm (37 in) 8 MeV machine (1937), and a 152 cm (60 in) 16 MeV machine (1939). He also developed a 467 cm (184 in) synchrocyclotron (1945). Lawrence received the 1939 Nobel prize in physics for this work. The first European cyclotron was constructed in Leningrad in the physics department of the Radium Institute, headed by Vitaly Khlopin [ru]. This Leningrad instrument was first proposed in 1932 by George Gamow and Lev Mysovskii [ru] and was installed and became operative by 1937. In Nazi Germany a cyclotron was built in Heidelberg under supervision of Walther Bothe and Wolfgang Gentner, with support from the Heereswaffenamt, and became operative in 1943. Diagram showing how a cyclotron works. The magnet's pole pieces are shown smaller than in reality; they must actually be as wide as the dees to create a uniform field. Vacuum chamber of Lawrence 69 cm (27 in) 1932 cyclotron with cover removed, showing the dees. The 13,000 V RF accelerating potential at about 27 MHz is applied to the dees by the two feedlines visible at top right. The beam emerges from the dees and strikes the target in the chamber at bottom. Diagram of cyclotron operation from Lawrence's 1934 patent. The "D" shaped electrodes are enclosed in a flat vacuum chamber, which is installed in a narrow gap between the two poles of a large magnet. Sketch of a particle being accelerated in a cyclotron, and being ejected through a beamline. A cyclotron accelerates a charged particle beam using a high frequency alternating voltage which is applied between two hollow "D"-shaped sheet metal electrodes called "dees" inside a vacuum chamber. The dees are placed face to face with a narrow gap between them, creating a cylindrical space within them for the particles to move. The particles are injected into the center of this space. The dees are located between the poles of a large electromagnet which applies a static magnetic field B perpendicular to the electrode plane. The magnetic field causes the particles' path to bend in a circle due to the Lorentz force perpendicular to their direction of motion. where B is the magnetic field strength, q is the electric charge of the particle and m is the relativistic mass of the charged particle. Each time after the particles pass to the other dee electrode the polarity of the RF voltage reverses. Therefore, each time the particles cross the gap from one dee electrode to the other, the electric field is in the correct direction to accelerate them. The particles' increasing speed due to these pushes causes them to move in a larger radius circle with each rotation, so the particles move in a spiral path outward from the center to the rim of the dees. When they reach the rim a small voltage on a metal plate deflects the beam so it exits the dees through a small gap between them, and hits a target located at the exit point at the rim of the chamber, or leaves the cyclotron through an evacuated beam tube to hit a remote target. Various materials may be used for the target, and the nuclear reactions due to the collisions will create secondary particles which may be guided outside of the cyclotron and into instruments for analysis. The cyclotron was the first "cyclical" accelerator. The advantage of the cyclotron design over the existing "electrostatic" accelerators of the time such as the Cockcroft-Walton accelerator and Van de Graaff generator, was that in these machines the particles were only accelerated once by the voltage, so the particles' energy was equal to the accelerating voltage on the machine, which was limited by air breakdown to a few million volts. In the cyclotron, in contrast, the particles encounter the accelerating voltage many times during their spiral path, and so are accelerated many times, so the output energy can be many times the accelerating voltage. , which is determined by the diameter of the magnet's pole pieces. So very large magnets were constructed for cyclotrons, culminating in Lawrence's 1946 synchrocyclotron, which had pole pieces 4.67 m (184 in) (15.3 feet) in diameter. would be the cyclotron angular frequency in classical approximation. where v would be the (linear) velocity. again is the relative velocity of the particle beam. The rest mass of an electron is 511 keV/c2, so the frequency correction is 1% for a magnetic vacuum tube with a 5.11 kV direct current accelerating voltage. The proton mass is nearly two thousand times the electron mass, so the 1% correction energy is about 9 MeV, which is sufficient to induce nuclear reactions. , like in the non-relativistic case. Also, the cyclotron frequency is constant in this case. The transverse de-focusing effect of this radial field gradient is compensated by ridges on the magnet faces which vary the field azimuthally as well. This allows particles to be accelerated continuously, on every period of the radio frequency (RF), rather than in bursts as in most other accelerator types. This principle that alternating field gradients have a net focusing effect is called strong focusing. It was obscurely known theoretically long before it was put into practice. Examples of isochronous cyclotrons abound; in fact almost all modern cyclotrons use azimuthally-varying fields. The TRIUMF cyclotron mentioned below is the largest with an outer orbit radius of 7.9 metres, extracting protons at up to 510 MeV, which is 3/4 of the speed of light. The PSI cyclotron reaches higher energy but is smaller because of using a higher magnetic field. For several decades, cyclotrons were the best source of high-energy beams for nuclear physics experiments; several cyclotrons are still in use for this type of research. The results enable the calculation of various properties, such as the mean spacing between atoms and the creation of various collision products. Subsequent chemical and particle analysis of the target material may give insight into nuclear transmutation of the elements used in the target. Cyclotrons can be used in particle therapy to treat cancer. Ion beams from cyclotrons can be used, as in proton therapy, to penetrate the body and kill tumors by radiation damage, while minimizing damage to healthy tissue along their path. Cyclotron beams can be used to bombard other atoms to produce short-lived positron-emitting isotopes suitable for PET imaging. More recently some cyclotrons currently installed at hospitals for radio isotopes production have been retrofitted to enable them to produce technetium-99m. Technetium-99m is a diagnostic isotope in short supply due to difficulties at Canada's Chalk River facility. Lawrence's 60-inch cyclotron, circa 1939, showing the beam of accelerated ions (likely protons or deuterons) exiting the machine and ionizing the surrounding air causing a blue glow. The cyclotron was an improvement over the linear accelerators (linacs) that were available when it was invented, being more cost- and space-effective due to the iterated interaction of the particles with the accelerating field. In the 1920s, it was not possible to generate the high power, high-frequency radio waves which are used in modern linacs (generated by klystrons). As such, impractically long linac structures were required for higher-energy particles. The compactness of the cyclotron reduces other costs as well, such as foundations, radiation shielding, and the enclosing building. Cyclotrons have a single electrical driver, which saves both money and power. Furthermore, cyclotrons are able to produce a continuous stream of particles at the target, so the average power passed from a particle beam into a target is relatively high. M. Stanley Livingston and Ernest O. Lawrence (right) in front of Lawrence's 69 cm (27 in) cyclotron at the Lawrence Radiation Laboratory. The curving metal frame is the magnet's core, the large cylindrical boxes contain the coils of wire that generate the magnetic field. The vacuum chamber containing the "dee" electrodes is in the center between the magnet's poles. The spiral path of the cyclotron beam can only "sync up" with klystron-type (constant frequency) voltage sources if the accelerated particles are approximately obeying Newton's laws of motion. If the particles become fast enough that relativistic effects become important, the beam becomes out of phase with the oscillating electric field, and cannot receive any additional acceleration. The classical cyclotron is therefore only capable of accelerating particles up to a few percent of the speed of light. To accommodate increased mass the magnetic field may be modified by appropriately shaping the pole pieces as in the isochronous cyclotrons, operating in a pulsed mode and changing the frequency applied to the dees as in the synchrocyclotrons, either of which is limited by the diminishing cost effectiveness of making larger machines. Cost limitations have been overcome by employing the more complex synchrotron or modern, klystron-driven linear accelerators, both of which have the advantage of scalability, offering more power within an improved cost structure as the machines are made larger. One of the world's largest cyclotrons is at the RIKEN laboratory in Japan. Called the SRC or Superconducting Ring Cyclotron, it has six separated superconducting sectors, and is 19 m in diameter and 8 m high. Built to accelerate heavy ions, its maximum magnetic field is 3.8 T, yielding a bending ability of 8 T·m. The total weight of the cyclotron is 8,300 t. The Riken magnetic field covers from 3.5 m radius to 5.5 m with the maximum beam radius of about 5 m (200 in). It has accelerated uranium ions to 345 MeV per atomic mass unit. TRIUMF, Canada's national laboratory for nuclear and particle physics, houses the world's largest cyclotron. The 18 m diameter, 4,000 t main magnet produces a field of 0.46 T while a 23 MHz 94 kV electric field is used to accelerate the 300 μA beam.The TRIUMF field goes from 0 to 813 cm (0 to 320 in) radius with the maximum beam radius of 790 cm (310 in). Its large size is partly a result of using negative hydrogen ions rather than protons; this requires a lower magnetic field to reduce EM stripping of the loosely bound electrons. The advantage is that extraction is simpler; multi-energy, multi-beams can be extracted by inserting thin carbon stripping foils at appropriate radii. TRIUMF is run by a consortium of eighteen Canadian universities and is located at the University of British Columbia. The spiraling of electrons in a cylindrical vacuum chamber within a transverse magnetic field is also employed in the magnetron, a device for producing high frequency radio waves (microwaves). The synchrotron moves the particles through a path of constant radius, allowing it to be made as a pipe and so of much larger radius than is practical with the cyclotron and synchrocyclotron. The larger radius allows the use of numerous magnets, each of which imparts angular momentum and so allows particles of higher velocity (mass) to be kept within the bounds of the evacuated pipe. The magnetic field strength of each of the bending magnets is increased as the particles gain energy in order to keep the bending angle constant. The United States Department of Defense famously asked for dailies of the Superman comic strip to be pulled in April 1945 for having Superman bombarded with the radiation from a cyclotron. In 1950 however, in Atom Man vs. Superman, Lex Luthor uses a cyclotron to start an earthquake. ^ a b "Ernest Lawrence's Cyclotron". www2.lbl.gov. Retrieved 2018-04-06. ^ "Ernest Lawrence - Biographical". nobelprize.org. Retrieved 2018-04-06. ^ a b c Lawrence, Earnest O.; Livingston, M. Stanley (April 1, 1932). "The Production of High Speed Light Ions Without the Use of High Voltages". Physical Review. American Physical Society. 40 (1): 19–35. Bibcode:1932PhRv...40...19L. doi:10.1103/PhysRev.40.19. ^ Nave, C. R. (2012). "Cyclotron". Dept. of Physics and Astronomy, Georgia State University. Retrieved October 26, 2014. ^ a b c Close, F. E.; Close, Frank; Marten, Michael; et al. (2004). The Particle Odyssey: A Journey to the Heart of Matter. Oxford University Press. pp. 84–87. Bibcode:2002pojh.book.....C. ISBN 978-0-19-860943-8. ^ "Ernest Lawrence - Facts". nobelprize.org. Retrieved 2018-04-06. ^ Group, IPD (3 December 2015). "MEDraysintell identifies more than 1,200 medical cyclotrons worldwide". einnews.com. ^ Alonso, M.; Finn, E. (1992). Physics. Addison Wesley. ISBN 978-0-201-56518-8. ^ F.J. Mann, "Federal Telephone and Radio Corporation, A Historical Review: 1909-1946," Electrical Communications Vol. 23, No. 4 (December 1946): 397-398. ^ "Ernest Lawrence and M. Stanley Livingston". University of California, Berkeley. ^ Widerøe, R. (1928). "Ueber Ein Neues Prinzip Zur Herstellung Hoher Spannungen". Archiv für Elektronik und Übertragungstechnik (in German). 21 (4): 387–406. doi:10.1007/BF01656341. ^ "Breaking Through: A Century of Physics at Berkeley 1886–1968 2. The Cyclotron". Bancroft Library, UC Berkeley. 8 December 2008. Archived from the original on 2012-02-25. ^ "History / Memorial". V.G. Khlopin Radium Institute. Archived from the original on 2011-04-26. Retrieved February 25, 2012. ^ "History / Chronology". Archived from the original on 2011-04-26. Retrieved February 25, 2012. ^ Singh, Kongbam Chandramani (2009). Basic Physics. New Delhi: PHI Learning Private Ltd. pp. 211–212. ISBN 978-8120337084. ^ a b Lee, S.-Y. (1999). Accelerator physics. World Scientific. p. 14. ISBN 978-981-02-3709-7. ^ Thomas, L. H. (1938). "The Paths of Ions in the Cyclotron I. Orbits in the Magnetic Field". Physical Review. 54 (8): 580–588. Bibcode:1938PhRv...54..580T. doi:10.1103/PhysRev.54.580. ^ Hume, M. (21 February 2012). "In a breakthrough, Canadian researchers develop a new way to produce medical isotopes". The Globe and Mail. Vancouver. ^ Kamigaito, O.; et al. (2010). "Status of RIBF accelerators RIKEN" (PDF). Proceedings of the 19th International Conference on Cyclotrons and their Applications. ^ Glen Weldon; Michael Kantor. Superheroes! :Capes cowls and the creation of comic book culture. p. 91. Chao, Alexander W.; et al. (2013). Handbook of Accelerator Physics and Engineering (2nd ed.). World Scientific. doi:10.1142/8543. ISBN 978-981-4417-17-4. Feder, T. (2004). "Building a Cyclotron on a Shoestring". Physics Today. 57 (11): 30–31. Bibcode:2004PhT....57k..30F. doi:10.1063/1.1839371. Niell, F. M. (2005). "Resonance Mapping and the Cyclotron". —An experiment done by Fred M. Niell, III his senior year of high school (1994–95) with which he won the overall grand prize in the ISEF. Jardin, X. (12 Jan 2005). "The Cyclotron Comes to the 'Hood". Wired. —About a neighborhood cyclotron in Anchorage, Alaska. Look up cyclotron in Wiktionary, the free dictionary. National Superconducting Cyclotron Laboratory of the Michigan State University—Home of coupled K500 and K1200 cyclotrons; the K500, the first superconducting cyclotron, and the K1200, formerly the most powerful in the world. Rutgers Cyclotron—Students at Rutgers University built a 30 cm (12 in) 1 MeV cyclotron as an undergraduate project, which is now used for a senior-level undergraduate and a graduate lab course.